Website Content Editing Tool for editing your website. How Do I Easily Edit My WebSite Pages? Who Can Resist Free Stuff? Baltimore, MD., November 2007 – HindSite Interactive, Inc. a leading website development company based out of the Baltimore , Maryland area has announced today a 7-day, free trial offer of Easy WebContent. Easy WebContent is an online web based application that makes updating and editing websites available to anyone who owns or has a website – easy. The program is available online and it works with nearly all HTML based websites. With Easy WebContent anyone, even non-technical folks without prior web experience, can learn to update, edit content, or add new web pages. And now a 7-day, free trial offer should entice any skeptic to try the program with their own website or websites and see how simple the program is to use. 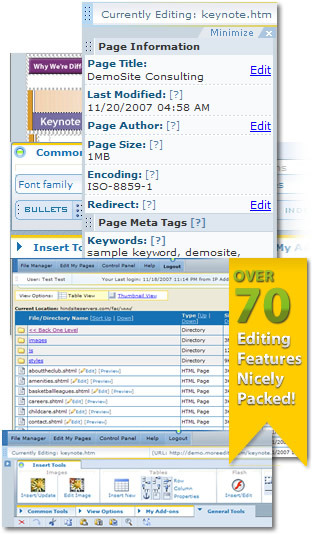 The program boasts over 70 website editing features that are simple to use and far exceed any other content editing tool on the market today. In addition, Easy WebContent eliminates the back and forth of reviewing with a third party such as a web designer or web developer plus the program works with all standard browsers and operating systems including PC's and Mac. “We want potential customers to just try it and see how easy the program is to use on your website, so we added the 7-day free trial offer. We're confident that this trial period will help persuade even the most hesitant users,” said Mr. Taei. In addition, Easy WebContent recently launched a powerful instructional video complete with a female voice over that explains and shows step-by-step instructions and gives real situational examples of how to use the program. The instructional video can also be used as a guide or mini-tutorial for new users to the program. HindSite Interactive, Inc. , headquartered in Frederick , MD , is a leading web site development firm specializing in customized web development, animation and interactive design. HindSite offers a broad range of services including 3D modeling, complex web applications, web site redesigns and marketing solutions. For more information about HindSite or Easy WebContent visit us on the web at http://www.hindsiteinteractive.com or http://www.easywebcontent.com . Free 14 Day Trial to Build or Edit your Website. Free Online Software to Create Professional Presentations, Animations, Infographics, and Product Demos. What is Easy Web Content?